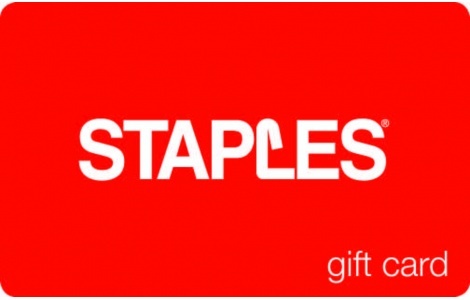 Valid only if purchased from a Staples U.S. retail store, at staples.com or if purchased or received from an authorized reseller or distributor; Staples reserves the right to not honor cards obtained from unauthorized sellers, including persons selling on auction Web sites, and to deactivate or reject cards issued or procured in connection with fraudulent transactions. Card has no value until activated. Lost, stolen or damaged cards replaced only with valid proof of purchase to extent of remaining card balance. Cannot be used for credit card payments or to purchase other gift cards (including Staples gift cards) or wireless cards. Not redeemable for cash or credit except where required by law. No more than five cards may be used for any single purchase. Cards may not be returned or consolidated. Card issued by Staples Value, LLC, a Virginia limited liability company.